Ideal Tax Solution, LLC is enhancing its ability to assist taxpayers in need with the creation of an expanded communication system which provides the capability to satisfy increased customer demand. 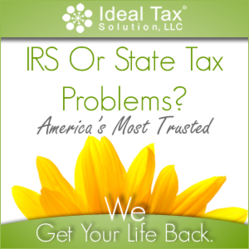 Ideal Tax Solution, LLC We Get Your Life Back! Industry sources believe future success for tax resolution companies will lie in their ability to be accessible while evolving and maintaining open lines of communication. Ideal Tax Solution, LLC is making professional tax debt resolution services available to an increasing number of taxpayers who are finding themselves in need of experienced tax relief companies. The burgeoning number of inquiries from people interested in consulting with tax liability specialists for tax help requires a continued commitment to service which begins with a phone call. The process of establishing a working relationship in which to accomplish the goal of tax debt relief starts with the formation of a comfortable, trusting rapport. From the moment a conversation is initiated between a tax liability client and a tax help professional, ongoing effective communication is the key to achieving successful tax resolution in a timely manner. Professional tax resolution is a combination of tax knowledge, financial expertise, interpersonal skills and effective communication. All phases of the resolution process are dependent upon a clear and constantly moving avenue of information. The smooth and efficient transfer of pertinent tax information allows for the process for tax relief to maintain a steady pace toward ultimate and speedy tax debt resolution. Industry sources believe future success for tax resolution companies will lie in their ability to be accessible while evolving and maintaining open lines of communication. Analysis obtained by Ideal Tax Solution has shown taxpayers in search of comprehensive tax debt resolution place a strong emphasis on ease of availability, superior communication, experience and knowledge of IRS procedures before selecting a tax relief company. Resolving tax liability is an emerging area of expertise within the financial service industry. Beyond the fundamental knowledge of fiscal protocols and IRS rules and regulations, tax relief specialists must also possess a developed skill for interacting with individuals whose lives have been dramatically, and, in many cases, unexpectedly uprooted by an IRS debt collection process. Engaging the services of a professional tax resolution company requires effective two-way communication. Tax liability specialists offer a quick, painless transition from delinquent taxpayer to taxpayer in good standing.